Charlotte is on track to be the first person in her family to go to university. Smart, driven and very passionate about the field of economics, Charlotte has her eye on a Bachelor of Commerce degree. The day Charotte finds out she is pregnant is the day that the last surgical abortion facility in her home state of Tasmania closes its doors. Ten weeks pregnant, Charlotte can only access a surgical abortion and only if she travels interstate. Charlotte’s story illustrates just one of the issues of abortion access in Australia: the tyranny of distance. Australia is a big country with a highly dispersed population and relatively long distances between capital cities and population centres. While Australians have good access to healthcare compared to many other developed nations, when it comes to abortion, access is not so good. Abortion is a safe and common health service.1 Yet it is deeply stigmatised and its availability, legality and cost varies between states and territories. The patchwork access and lack of publicly funded abortion services mean women often need to travel long distances, at great cost, to access a service. The stigma of abortion also means that many women will travel far in order to maintain their privacy. As a national not-for-profit provider of abortion, Marie Stopes Australia sees the impact that lack of access, social stigma and distance have on Australian women. 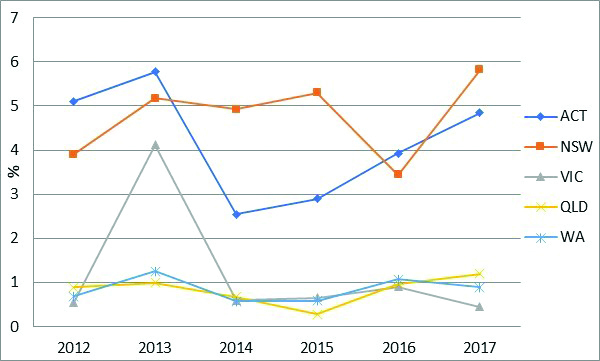 To get a grasp on the specifics that distance and access plays, we recently reviewed 138,800 medical records from 2012–17, from our clinics across the country. What these records show is not only poignant in terms of the women’s stories, but it also reveals how abortion has changed in Australia over the last six years. There are two types of abortion accessible in Australia: medical and surgical. Medical abortion, using a combination of mifepristone and misoprostol, became widely available on the Pharmaceutical Benefits Scheme in 2013. Since then, the number of Marie Stopes Australia’s patients choosing medical over surgical abortion has grown from 24.7 per cent in 2012 to 39.7 per cent in 2017. Figure 1. 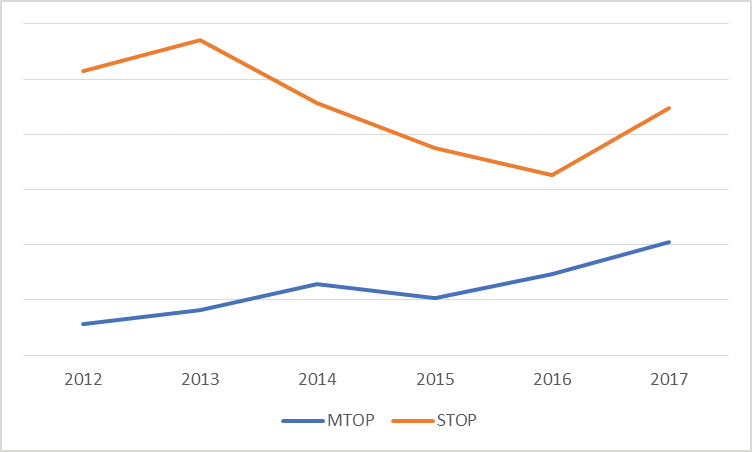 Trend and type of termination of pregnancy (TOP), all States (2012–17). There is no doubt that medical abortion has increased access to the service for Australian women. Most states and territories, apart from the ACT and South Australia, can provide the service in general practice and telehealth settings. However, the service is only available up to 63 days gestation. Beyond that, a surgical abortion is required. The increase in medical abortion does not spell the end for surgical abortion, as there will always need to be a service available to Australian women based on their gestation, compounding co-morbidities and personal preference. This reinforces the importance of women having access to both medical and surgical abortion procedures in relatively close proximity. Our medical record review has shown that women will travel interstate to access a service. In the past year, the number of women doing so has increased by 22 per cent. While the majority of women are travelling for surgical abortion, women will also travel to access medical abortion. Figure 2. Trend of women who travel to access (TOP) by procedure type. Of the number of women that travelled interstate to access a surgical abortion, the highest percentage travelled from New South Wales and the ACT. Women from South Australia, where abortion is only available through ‘prescribed hospitals’, tended to travel to Melbourne, and generally before nine weeks gestation. Women from the Northern Territory travelled to Queensland. 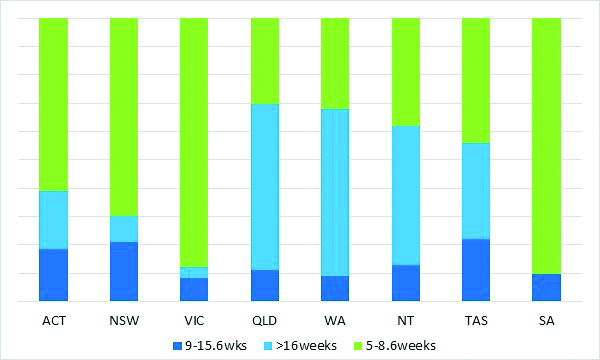 Where gestation was over 16 weeks, women from the Northern Territory were more likely to travel to Melbourne or Sydney. Of women in the Northern Territory who travelled, 87 per cent were at least 16 weeks gestation. Figure 3. Percentage of women who travelled interstate to access surgical TOP by year (all gestations). Tasmanian women seeking an abortion mostly travelled to Melbourne, with 35 per cent being in excess of 16 weeks gestation. Women from Western Australia were the least likely to travel. Of those who did travel, 59 per cent were in excess of 16 weeks gestation. It was also rare for Victorian women to travel, with fewer than 100 women accessing clinics in other states over the five-year period. Of those who did travel interstate, most were from regional or rural Victoria. Queensland women tended to access services within their own state, a surprising finding given that abortion is still in the Criminal Code in that state. Of those who did travel, 58 per cent were over 16 weeks gestation. Figure 4. Women who travelled interstate to access a surgical TOP by gestation (2012–17). 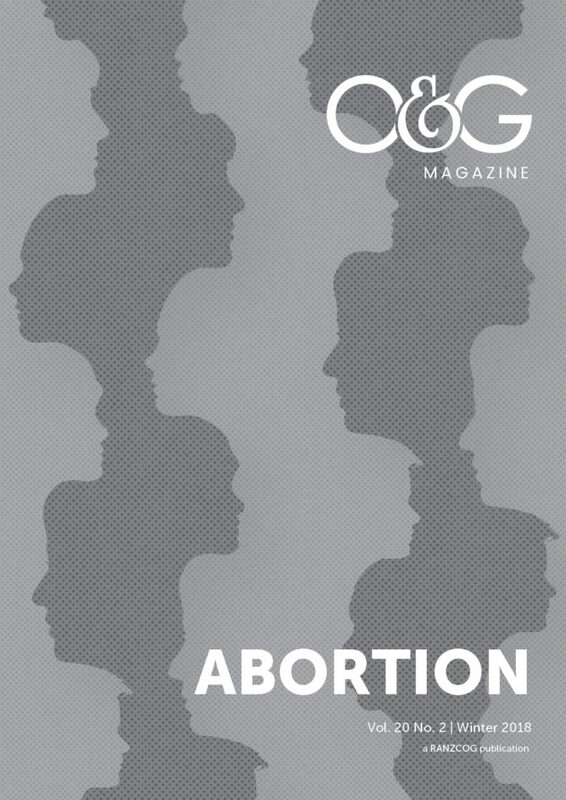 Gestation plays a key role in the travel patterns of women accessing abortion. This is understandable given the differing regulation of gestational limits in each jurisdiction. The review of the medical records validates this. It showed that, understandably, women preferred to access abortion early (5–8.6 weeks), and close to where they live. Early access is preferable because it minimises out-of-pocket expenses, negates the need to travel and provides the woman with greater choice (medical versus surgical abortion). When it comes to later gestation abortion, the majority of women who travelled interstate came from Queensland and Western Australia, followed closely by the Northern Territory and Tasmania. 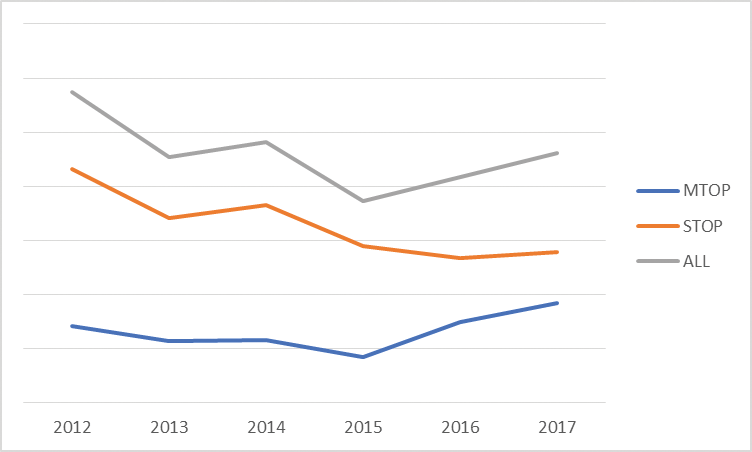 There are a very small number of clinics in Australia that operate beyond 16 weeks gestation, so this trend is understandable. However, it highlights the need for more clinicians and facilities that can provide this service in each state and territory. At the moment, Marie Stopes Australia is the largest provider of abortion services. Many of us working in abortion care acknowledge that the provision of services in the right place and at the right time is challenging. What this analysis has provided is some further guidance on how to assist women in decreasing the need for long-distance travel to access abortion. Medical abortion has helped increase access for women under nine weeks gestation. However, we can and must do better at increasing the number of registered prescribers. Currently, GPs wanting to provide medical abortion are required to become certified prescribers, by completing a free online training course. O&Gs are not required to complete the course to become certified prescribers. Providing both surgical and medical abortion services in each state and territory is important. 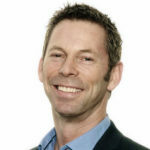 While this is happening to a varying degree, there is, at the time of going to print, no readily accessible surgical provision in Tasmania, limited medical abortion provision in the ACT and limited surgical provision in the Northern Territory. Patchwork laws and regulations, particularly those governing gestational limits, are not only confusing, they also limit a woman’s ability to access abortion services in her state or territory. Having uniform higher gestational limits (for example, up to 24 weeks), could decrease the need for travel. At the same time, we need a larger workforce in abortion care that can provide both services competently and confidently in their home states. This requires consistent national training in abortion care for clinicians. Addressing stigma around abortion is exceptionally challenging given some of the deeply entrenched beliefs. Australia is, however, a progressive society in a number of ways, so it is important that we tackle the social stigma around abortion. This starts with viewing it for what it is: a common and important health procedure that is necessary for many women in our community. While this article has dealt with the issue of physical access, the findings of the research tie into the need for greater public provision of abortion care across Australia. Public funding of termination services is patchy and provides uneven access, where some parts of the country have reasonable access, while others have little to no public access. Where a woman lives should not determine her accessibility to a publicly funded service. Ultimately, the fairest way to remedy this is to move state funding of abortion care to the Federal Government and deliver services under the banner of primary healthcare. This will drive reforms at state and territory level and make it less confusing for women. Shifting the funding will also create an opportunity to collect uniform data for epidemiological, policy development and service delivery planning purposes. WHO. Safe Abortion: Technical and Policy Guidance for Health Systems (2nd edn). 2012. 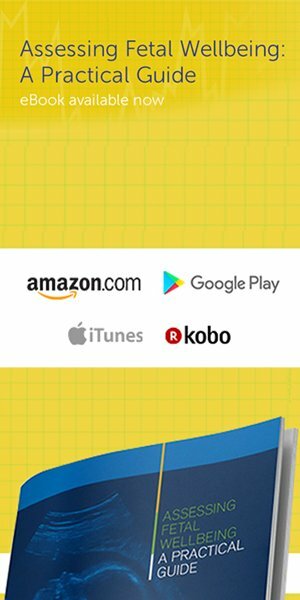 Available from: http://apps.who.int/iris/bitstream/10665/70914/1/9789241548434_eng.pdf [accessed 22 March 2018]. 123p. Guttmacher Institute. Abortion Worldwide 2017. Uneven Progress & Unequal Access. New York: 2018.4.